Geeta on the A muse Addicts board challenged members to do the Splitcoaststampers Dirty Dozen Challenges for the month using A muse stamps. You can only access the Dirty Dozen gallery and challenges if you are a fan club member...well worth it! Of all challenges, I like sketch challenges the best, so I went for that one. I had stamped and coloured the main image while I was away camping. I thought Flower Girl looked a bit suspicious (0r pleased with herself) after walking by the Flowerpots and helping herself to a few! Love it when a big chunk of work is done already! I cut the main image and mat with my oval nesties. For the rectangle panel at the bottom, I took inspiration from Julie's card featuring 3 lines of ribbon. Lots of sponging to dirty up the vanilla paper helped to make it less bright and stark. The rest explains itself! Accessories: copics, oval nestibilities, SU hodgepodge hardware, SU large and small oval punches, brown velvet ribbon by SEI (I think), pop dots. Love this!!!! 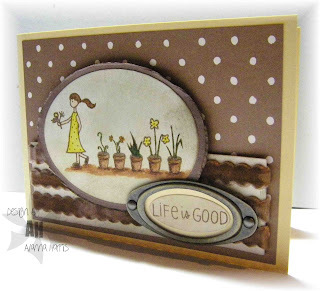 Flower girl is a perfect match with the flower pots ~ I never put the two together. DUH!